There are 27 Assisted Living Facilities in the Wheaton area, with 3 in Wheaton and 24 nearby. The average cost of assisted living in Wheaton is $3,856 per month. This is higher than the national median of $3,346. Cheaper nearby regions include Naperville with an average starting cost of $3,724. To help you with your search, browse the 291 reviews below for assisted living facilities in Wheaton. On average, consumers rate assisted living in Wheaton 4.2 out of 5 stars. Better rated regions include Glen Ellyn with an average rating of 4.5 out of 5 stars. Caring.com has helped 6 families in Wheaton find high-quality senior care. To speak with one of our Family Advisors about assisted living options and costs in Wheaton, call (855) 863-8283. Wheaton, a suburban city in DuPage County, has a population of 58, 568 with a median age of 38. It is an affluent community located close to Chicago and Lake Michigan. Seniors looking to live in this area have over three dozen assisted living facilities (ALFs) to choose from. ALFs in Illinois, as in the rest of the state, are defined by the Illinois Department of Public Health as those having three or more unrelated residents, 80 percent of whom are aged 55 or older. This government agency also oversees licensing and inspections of ALFs, ensuring the care of Illinois seniors. The Wheaton, Illinois, area is home to world-class medical facilities including Northwestern Medicine Central DuPage Hospital and Wheaton Medical Center, in the event of medical emergencies or illness. Located 30 miles west of Chicago, Wheaton is known for its mild summers and cold, snowy winters. The average high temperature in January is 32 degrees Fahrenheit and 87 degrees Fahrenheit in July. Wheaton has an array of community resources for seniors, including DuPage County Senior Services, a government agency that offers meals, legal services and discounted transportation to seniors age 60 and older, as well as a senior center. Crime isn't the nearly the problem in Wheaton that it is in many other Chicago suburbs. In fact, the overall crime rate in Wheaton has decreased by 12 percent in recent years and is 76 percent lower than the national average. For those seniors who drive, Wheaton is just a few miles west of I-355, which connects the area to I-88 and other parts of Chicagoland. For public transportation, the city is located on the Metra commuter light rail line. Metra offers reduced fares for seniors age 65 and older who obtain a reduced fare permit. There are many fun and interesting things to do in and around Wheaton, Illinois. These include Cantigny Park, with its 500 acres of gardens, the Illinois Prairie Path and its 61 miles of hiking trails, the Billy Graham Center Museum and the Robert McCormick House. Most Wheaton events and attractions offer a senior discount, although the qualifying age varies. Assisted Living costs in Wheaton start around $3,856 per month on average, while the nationwide average cost of assisted living is $4,000 per month, according to the latest figures from Genworth’s Cost of Care Survey. It’s important to note that assisted living rates in Wheaton and the surrounding suburbs can vary widely based on factors such as location, the level of care needed, apartment size and the types of amenities offered at each community. Eligible seniors who live in Wheaton can turn to a number of state and federal assistance programs for help with the cost of assisted living. 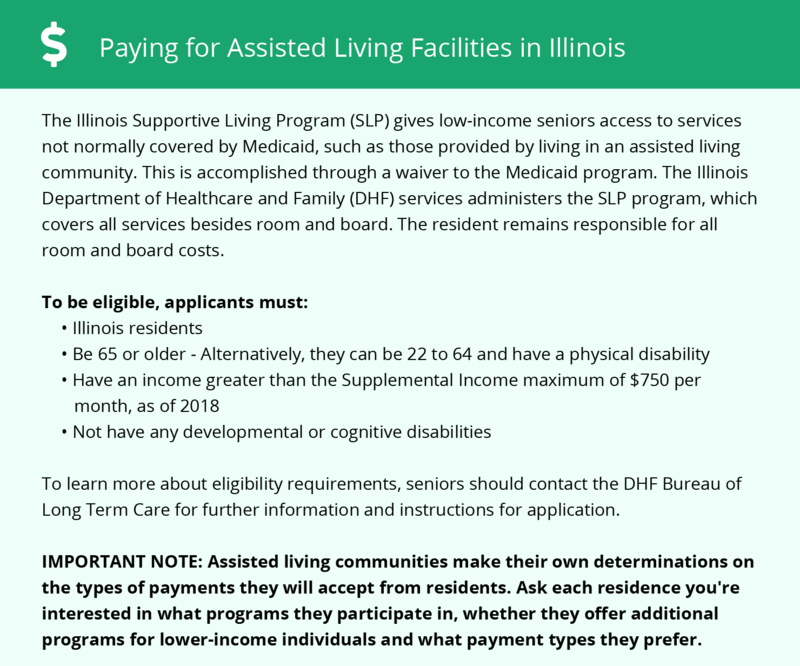 These programs include Choices for Care, the Illinois Supportive Living Program (SLP) and Supplemental Security Income Category G.
Wheaton and the surrounding area are home to numerous government agencies and non-profit organizations offering help for seniors searching for or currently residing in an assisted living community. These organizations can also provide assistance in a number of other eldercare services such as geriatric care management, elder law advice, estate planning, finding home care and health and wellness programs. To see a list of free assisted living resources in Wheaton, please visit our Assisted Living in Illinois page. Wheaton-area assisted living communities must adhere to the comprehensive set of state laws and regulations that all assisted living communities in Illinois are required to follow. Visit our Assisted Living in Illinois page for more information about these laws.